The key to boating safety is education. Familiarity with safety and equipment requirements is a first step in the right direction. Incorporate regular training, or practice, with your crew on your boat, to make sailing as safe as possible. Note that while there are a number of agencies telling you how to use your boat more safely, the USCG requirements are clear and indisputable legal requirements for safe boating (in the USA). Lower on the page are safe boating requirements for sailboat racing, other recommendations, and more safe boating resources. We hope that even knowledgeable yachtsmen will find valuable information through this page. This page is not intended to be your all-inclusive instruction manual for safety at sea. Read widely, study, take classes, anticipate, prepare, practice. Old MOB pole or new dan buoy? The following resources reflect long experience and careful research on maritime safety. Please explore them. 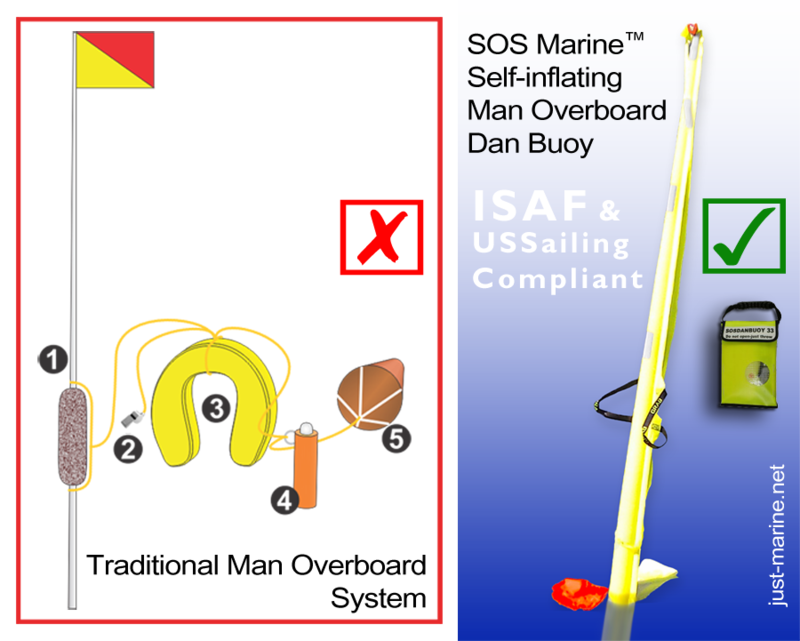 Please click to information about preventing man overboard and what to do when you have a man overboard. Here is a listing of interesting boating safety requirements for special circumstances. Hans Anderson is a marine surveyor who has compiled a great page of links. Have We Missed One of Your Favorites? If you know of a great boating safety resource we should include here, please let us know in comments, below!